Hundreds of people took to the streets of Vernon last week to call for the closure of Exide Techonologoes, an embattled lead-acid battery recycler in the city. “Stand by our side, shut down Exide,” chanted residents and environmental activists from Boyle Heights, Maywood and Huntington Park. 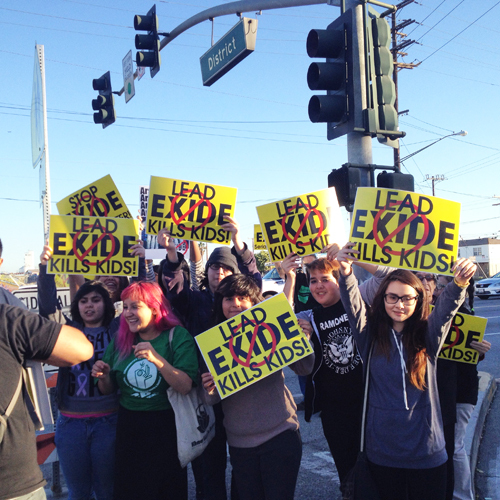 For the protesters, the problems go beyond Exide. They accused DTSC of engaging in flagrant environmental racism, saying the regulatory agency has not shut down Exide, despite its long history of air quality violations and arsenic emissions, because the affected communities are home to working-class Latinos. “DTSC’s actions show that it has placed Exide’s and the State’s financial interests above the Latino community’s human right to breath clean air and live in safe communities,” said Milton Hernandez-Nimatuj, a youth organizer with CBE, Communities for a Better Environment. The participants pointed to the nearly identical Exide facility that was shut down in the white-affluent city of Frisco, Texas as proof of their claim. The group accused DTSC of imposing lighter fines and entering into settlement agreements instead of shutting down the plant that up until recently had been operating on a temporary permit. But DTSC continues to say the agency is fully aware of the community’s concerns and they are holding Exide accountable. “We are carefully and thoroughly evaluating Exide’s compliance record, including these most recent violations, as part of our decision on their permit application. We will make a decision before the end of the year, and in the meantime, wherever we see non-compliance, we will issue violations,” DTSC Spokesman Sandy Nax said in a statement to EGP. The Vernon plant has been closed since March 2014 to make equipment improvements to meet South Coast Air Quality Management District air quality standards. DTSC must decide whether to issue a permit by the end of the year or Exide would face closure. Gladys Limon, staff attorney at CBE, said Exide does not deserve that permit. DTSC countered that the permit process has been transparent and open to the public and a public comment portion will be considered before the agency’s final decision. Representatives of L.A. County Supervisor Hilda L. Solis and the County’s Department of Community and Senior Services also took part in the rally and the supervisor pledged the County’s support to “protect the health and safety of communities threatened by pollution from the Vernon plant.” She pledged assistance to workers who could be displaced if Exide is closed permanently. According to Solis, the county will be leading three special orientations for Exide dislocated workers in Huntington Park, Santa Fe Springs and East Los Angeles. On Feb. 10, she told her fellow supervisors that county health officials should make department staff available to follow up on the lead blood testing program, both to discuss the results of tests already taken and to encourage more people to get tested by the end-of-the –month deadline. “No community should receive less of what they are entitled to. Let’s level the playing field,” Solis said during the board meeting. Exide, however, continues to say the company is committed to working with regulators to meet permit requirements and health and safety standards, and to get their approximately 135 employees back to work. “We recognize the community’s concerns and are committed to engaging openly and transparent with local residents,” said Tom Strang, vice president for Exide’s Evironment and Safety, in a statement. Exide officials say the company has invested $35 million in environmental, health and safety measures since 2010. Monsignor John Moretta of Resurrection Church in Boyle Heights said re-training Exide employees is key. “Surely our political leadership agrees that the safety and health of 100,000 people is more important than 100 jobs which pose grave danger to workers,” he said at the Vernon rally. 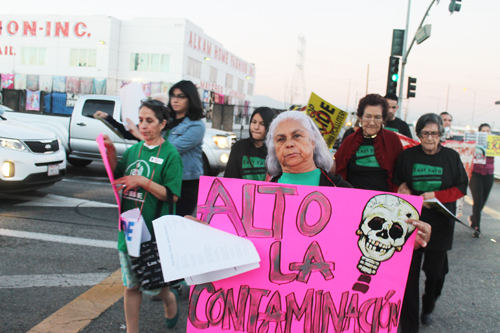 AQMD previously found that 110,000 people in the area were exposed to cancer-causing chemical emissions from Exide. Vernon Councilmember-elect Melissa Ybarra told EGP that she drives by Exide everyday on her way to work but she has yet to take a stance on the controversial topic. However, like her father before her, she too is concerned about the plant. “My concern is making sure the employees are healthy,” said Ybarra, who was elected Tuesday to fill out her late father’s term. Mark Lopez, director of East Yard Communities for Environmental Justice, is not satisfied by the company’s efforts to remediate the health concerns. He said his mother and grandmother fought against environmentl justice in the 1990s, and things haven’t change.